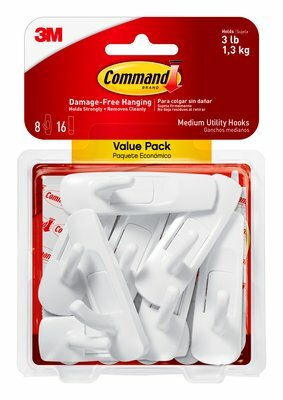 Command™ Medium Utility Hooks Multi-Pack is rated 4.6 out of 5 by 91. Rated 4 out of 5 by Barb41 from Great hooks I bought these last year. They work well. Be aware of the weight capacity as I used three pound hooks for an item that was exactly three pounds and after a few months, it fell off the wall. I would recommend going up to the next hook. But, no damage to wall. Definitely recommend. Rated 5 out of 5 by Mommycole from Helps sooo much!! My husband and I both use CPAP machines and finally found a solution to the mask and hose in the way on the night stand. Installed these hooks to the side of the headboard and they are now kept out of the way and out of sight. I love it! Rated 5 out of 5 by Jksanford from Usefu in every room! I have used the medium hooks in the kitchen, laundry room, bathroom, kids' rooms etc. They are sturdy and don't pull off the walls like other brands I have tried. Rated 5 out of 5 by Jellenk from Use them at home and work. I love hanging baskets in my classroom using these hooks. Could not organize without these. Rated 5 out of 5 by Mango from Unlimited uses! I love Command Hooks, I actually have them in almost every room in my home. Rated 5 out of 5 by CathyF from Very practical! I needed a hook for my shower puffs and found the right product with #M Command!